It's summer already, and you know what that means. Right at this very moment, the insect world is plotting against us. These bugs have plans to overpopulate and attack the human race. They'll soon be everywhere--in gardens, at picnics, on flowers, and hanging around lightbulbs at night. There is only one thing a public spirited citizen can do: arm himself with a can of insecticide and join the ranks of the Pest Patrol. Written in machine language by Mark Allen, Pest Patrol is one of Sierra Online's newest Apple offerings. Basically, this program is a shoot-'em-up game. 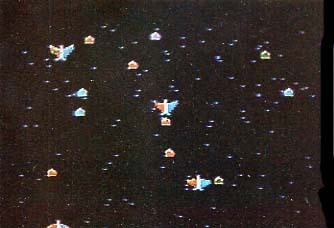 Your can (shooter) is restricted to horizontal movement at the bottom of the screen; the insects swirl and swarm in the skies above you. The thing that makes it unique in a crowd of games with similar themes is that Pest Patrol has a staggering total of 40 different waves of insects. Before you get into the thick of play, you must first set a few parameters. You have a choice of game controls: keyboard, joystick, paddles, or Atari joystick. I don't recommend using the keyboard because it is very difficult to come to a precise halt, and also because you can't re-define the control keys. A self-centering joystick works best for me. After selecting the desired controller, you set the speed of the action to either the fast or slow mode. When all of these details have been taken care of, you may play a practice game or a standard game. At the practice setting, you are given 77 cans, but you can't progress past level 29. You start a normal game with four cans, and an extra can is awarded for every 1500 points you earn. Your shooter, a spray can, has an endless supply of insecticide, as well as the ability to shoot rapid-fire bursts. After a bit of continuous shooting, your firepower is cut drastically. If you cease fire for a short time, your can is restored to full strength. When the game begins you must be on your toes, with finger twitching nervously above the fire button. As the bugs start swarming in the dark sky above you, blast away at them. The insects follow elaborate flight paths which are the same from game to game. This makes it easy to memorize where they enter the screen, and how best to dispose of them. Each time you eliminate an attack wave, you advance to the next level. Levels are distinguishable by a change in the behavior of the bugs. Most of the 40 levels of play are significantly different from one another, but some do repeat, although they are spaced so far apart that the game isn't repetitious. As you exterminate the pests, you must be wary of the insidious tricks that they have in store for you. The bugs are armed with an arsenal of bombs--four different types in all. Simple bombs are thrown directly at you, and they explode on impact with the ground. Homing bombs are a little more aggressive; they move diagonally across the screen, following the movements of your shooter. Time bombs fall like simple bombs, but they remain at the bottom of the screen for a short period of time, waiting for you to run into them. After a few seconds, these bombs explode harmlessly. Homing time bombs combine the dangerous natures of both the homing and time bombs into one very deadly package. Coming in contact with anything except a snail causes instantaneous death, which sends you back to the beginning of the previous level. Aside from the baffling number of attack waves, another impressive feature of Pest Patrol is the excellent use of the hi-res graphics. The squirming bugs are animated with detailed movements that give them a realistic, life-like appearance. If we are to be safe during our patio cook-outs, you must overcome a variety of pests. In addition to the seemingly harmless bugs such as butterflies and snails, Pest Patrol is replete with more disgusting forms of low-life: worms, spiders, fleas, and beetles. Some insects look so creepy that they may elicit cries of "ick!" from the younger gamesters. Pest Patrol offers even the most determined and skilled player a great challenge if he wants to get a peek at the attack waves that lay beyond level 30. For those who have enjoyed only minimal success at other shoot-'em-ups, Pest Patrol can be played at the slow setting in the practice mode, insuring longer game play. I continue to enjoy this game because it has something that many other programs need desperately: variety.